Know the way to San Jose--or anywhere else--with this customizable piece. Destination knew--she was just as important as Journey. Making the case is artist Chris Crooks, who has designed his own take on the classic directional sign that incorporates your personalized landmarks. 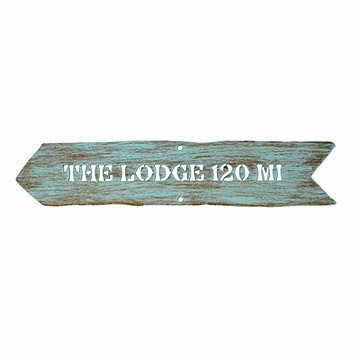 Commemorate the family homestead, point the way to your lakeside getaway, or mark the miles to Grandma's house, all in your choice of colors and fonts (there's a variety to pick from). Hang it on its own or use as a replacement sign for your Personalized Family Member Signpost. Each sign is finished with a dry brushed texture, giving it a warmly worn look that makes this piece a charming addition to any setting. Any which way you decide to go. Made in Tucson, Arizona. Click here to see our Personalized Family Member Signpost. Each sign is 18-24" L depending on text. See notes below for the height of each color sign. Can be hung indoors or outdoors. The finish can be maintained by applying car wax once a year, or as needed. Due to the weight and surface area of each sign, each signpost can hold a maximum of six. If you need more, we recommend buying two Personalized Family Member Signposts. Received the complete family directional sign containing all my children and grandchildren's names and mileage from our home. This was the best gift to receive. We erected in our front yard, so each time I walk outside I see all the names of our family. Great way to start your day!! Had to purchase an additional name sign to include our new granddaughter. Great colors to choose from. Just love this gift and get to enjoy it daily. This has been the best gift EVER! Two years later my family moved and I was able to purchase a single directional sign to update the mileage to our new home. The sign was easy to replace with 2 simple screws and it looks great! Customer service was outstanding and product was quality. We have traveled around the world and on each arrow I put our destination with the amount of miles that particular destination was from our city. My dad loved it and gave our lake home a special beachy Key West feel. I have to wait for the ground to soften before I can set it up, so it is too early to comment on how easy that will be. My husband is part time in Washington, and I am part time in Florida, so had a sign that pointed to the city I lived in for him. It is so nice! Not sure how I wound up on your website but glad I did! I ripped my own piece of 5/16" X 4" rough sawn cedar and created a typical sign post. Signs were simple to attach! I love my directional sign!